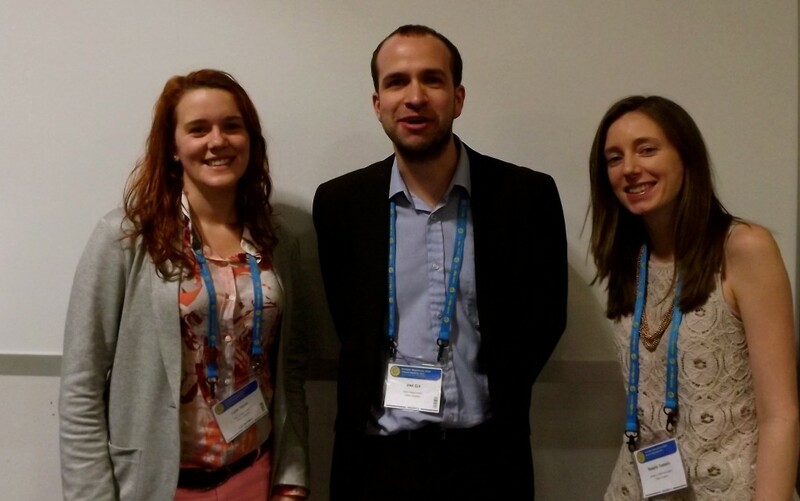 Mid-week at the EGU conference, and we’ve finally got all three GfGD reps in the same place at the same time for a photo! Prior to the devastating earthquake in 2010, cholera had never been reported on the small island of Haiti. The outbreak of the disease in the wake of the earthquake affected nearly 8% of the population and killed over one in a hundred. The disease is now endemic in the country and may never leave. The disease was most likely brought into the country by UN soldiers, who arrived to help the Haitian people after the earthquake – the DNA of the virus has been linked to outbreaks in Nepal. Outbreaks of cholera during the epidemic correlate closely with rainfall patterns. If we can predict rainfall patterns accurately, then maybe we can anticipate, and prepare for, the spread of disease. 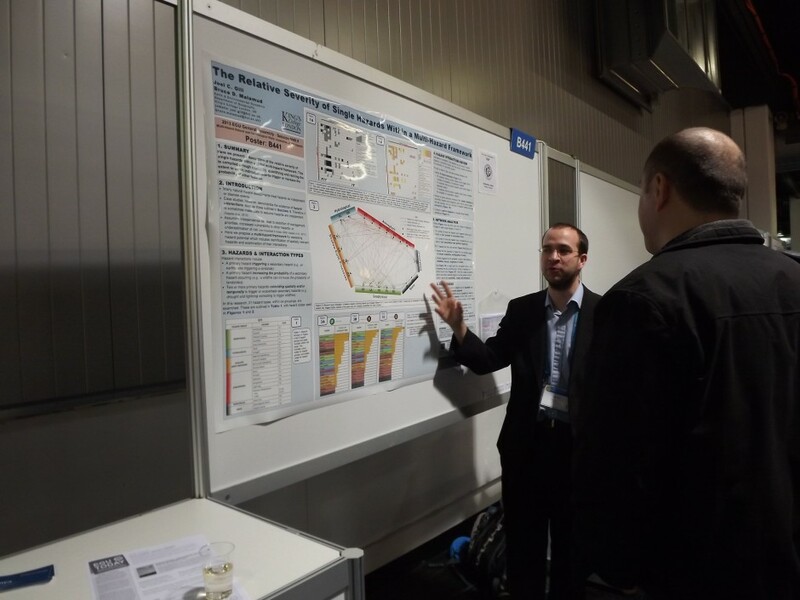 Enrico Bertuzzo and Andrea Rinaldo, based at the École Polytechnique Fédérale de Lausanne in Switzerland, have created a model that accounts for rainfall as the driver of disease transmission by washout of open air defection sites or cesspool overflows. Their model allows us to draw longer term predictions for the cholera epidemic in Haiti, and the same model could be adapted to help us understand epidemics of other water borne diseases. 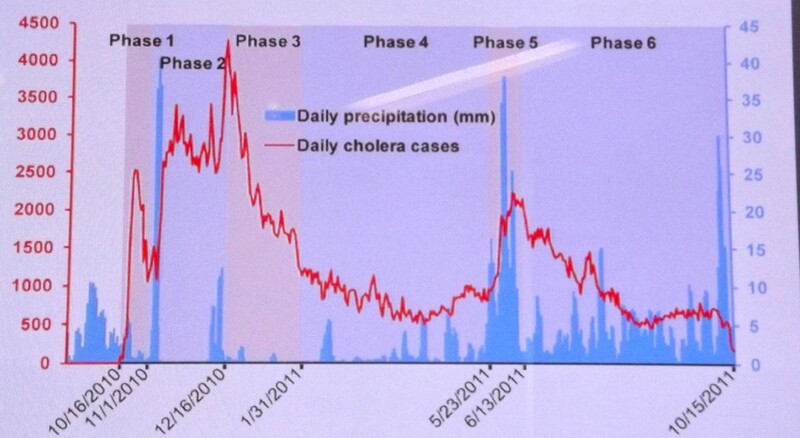 The red line tracks cholera outbreaks, and the blue bars show the amount of rain that fell during the same time period. There is a significant correlation between the two. Soils have an important influence on human health. It is soil that enriches our food with essential vitamins and nutrients, but it can also exposure us to harmful chemicals and disease causing organisms. Soil is closely tied to atmospheric cycles and can be influenced by changes in temperature, precipitation and carbon dioxide levels. Climate change could alter nutrient cycling and the carbon cycle, and in turn affect soils. Soil scientists and health experts are collaborating to try and forge a new academic field, looking at the link between soils and human health. This kind of cross disciplinary work is difficult because it doesn’t fit into our traditional research funding framework. Health and soil researchers are two groups that don’t normally talk to each other, so we need to encourage cross-disciplinary involvement if we want to increase our resilience to soil related health problems. The toll from natural disasters is increasing as populations rise. At the same time climate change is making the frequency and intensity of climate related events harder to predict. We cannot predict the precise location and timing of most hazards, but we can model risk, to help us understand how people and communities respond to events, and how countries prepare for the financial and human impacts of a disaster. People in developing countries are more vulnerable to disasters – 95% of the total number of deaths in disasters last year occurred in developing countries. This is a result of the increased exposure and vulnerability of populations in developing countries. Between 1980 and 2009, a total of 90 billion dollars was spent on disaster related activities. The majority of this money was spent on disaster response and relief, and under 5% was invested in prevention and risk management. The UK government’s Foresight report into Reducing the Risks of Future Disasters championed the idea that in risk management, prevention is better than cure. Investing in risk management and reduction makes financial sense. It is thought that the benefits outweigh the costs by a ratio of at least 4:1 in most cases. This means that for every pound we spend before a hazard occurs, we save four in disaster response operations. Countries can reduce their exposure to financial risk in disasters by grouping together and pooling the risk. This can significantly reduce the cost of disaster management. How can we ensure decision makers invest the pot of money available for disaster related activities in the most effective way? One problem we face is perceived risk from stakeholders. A fear of flying is common, but statistically, crossing the road puts you at a much higher risk – people’s perception of risk may not be proportional to the size of the risk. Disasters that receive the most press coverage tend to receive more funding. Cyclone shelters have been built and maintained in Tamil Nadu, India, for the last 40 years. These shelters could have been easily adapted to provide protection from tsunamis, but tsunamis were not a hazard that worried stakeholders in the area. The tsunami in 2004 resulted in seventeen thousand deaths. Clearly, the decisions made in this case were not based on sound science but on perceived risk from stakeholders. Nadejda Komendantova, a researcher in risk policy and vulnerability, thinks it would be good to have more communication between scientists researching natural hazards and policy makers working in disaster risk reduction. Geologists are able to quantify risk through studying the past activity of hazardous geological phenomena, for example, we can calculate the repeat time of earthquakes on a particular stretch of fault. This information is very valuable, and we need to make sure it is understood by decision makers and incorporated into policy. Investment in disaster related activities needs to be based on facts not opinions. People are starting to recognise the importance of investing in prevention rather than cure, but we still need to put more emphasis on incorporating good geoscience into disaster risk management. What are the chances of an earthquake triggering a landslide, which causes a tsunami and leads to flooding? Joel Gill, GfGD Director, is researching the extent to which an individual hazard increases the probability of other hazards occurring as part of a PhD at Kings College London. Tags: European Geosciences Union, Geology for Global Development. Bookmark the permalink.